Ambush Bug might not have been an A-list character but for the better part of a decade he was a reliable source of lols at the expense of the rest of the DC Universe. Another Keith Giffen creation, you can see for yourself in the two mini series and several specials published between 1984 and 1992. (He still shows up in random cameos from time to time.). 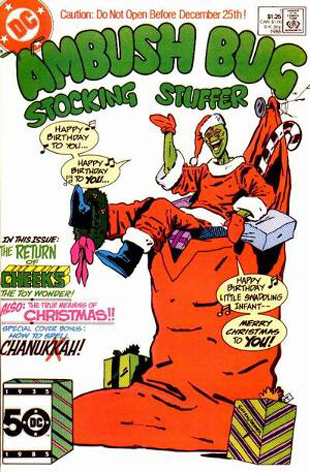 The best of those specials was this ode to Christmas excess from 1986, by Giffen, along with writer Robert Loren Flemming and Cover Artist Bob Oksner. The story is completely batshit. It starts with Ambush Bug trying to fight the Vietnam War (despite the fact that it had been over for 10 years by this point), then ending up in a battle with Atari Force's Hukka. Eventually, Ambush Bug takes over the comic and the plot changes to a story about his coping with the death of Cheeks. Who comes back as a zombie. It gets wackier from there, until Ambush Bug's holiday wishes are granted when the embodiment of DC Comics continuity provides him with a non-zombified Cheeks, and then sends him to Arkham. ANYWAY, If I could have one wish come true this Christmas, it would be for Batman to be replaced as DC's most popular character by Ambush Bug. Sadly that's about as likely to happen as Santa turning out to be real, which frankly is a damn shame. I mean come on, his arch enemy is a sentient sock named Argh! Yle! and his sidekick is a discarded doll he calls Cheeks, The Toy Wonder. But y'all are haters so never mind.